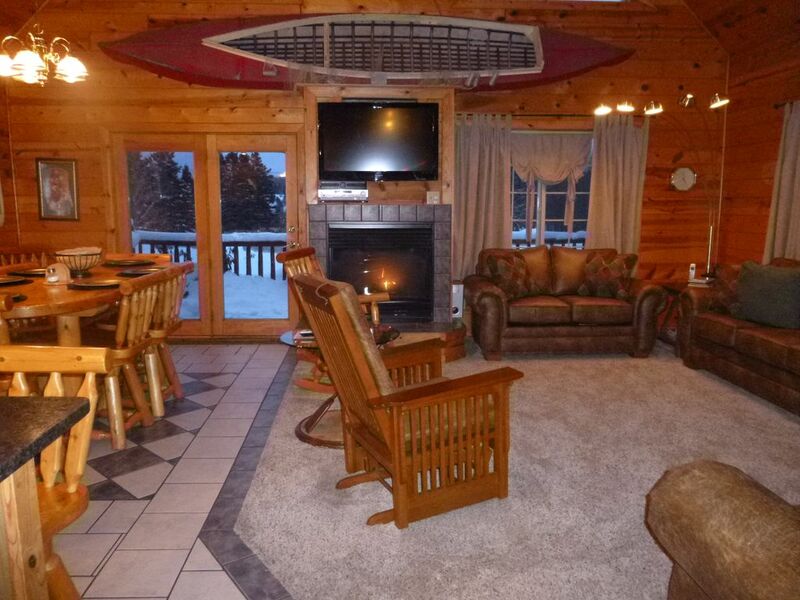 Kemp's Four Seasons Log Home is the perfect get-away with all the conveniences of home. Kemp's Log Home is located 1.5 miles from endless snowmobile trails - Leave right from the home with your snowmobile and groomed cross country ski trails; 3 miles from beautiful Chassell Bay featuring swimming, convenient boat launch, volleyball court, basketball court, horseshoes and fishing dock. 9 miles from historic Downtown Houghton / Hancock the Gateway to the Copper Country and 22 miles from all night entertainment at the Ojibway Casino in Baraga. Nine 0 Six four eight three zero three three four with questions? This beautiful log home includes: 1600 square feet of Spacious Living that Sleeps 11 - comfortably! 4 bedrooms with 1 walk-thru, 2 full baths, whirlpool in Master Bedroom with TV and VCR, free WIFI, loft with day bed, gas log fireplace, snack bar - dinning room and great room. Radiant in floor heating!! All linens, dishware and robes are provided. Very relaxing on 5 acres and paved roads!! Perfect place and centrally located to all that the Keweenaw has to offer!! Very well kept and clean home on 5 acres in the country yet close to town. Paved roads to get to house. In floor Radiant heat! Kitchen with granite countertops, SS appliances with Ice Maker, Gas Stove, Dishwasher and microwave oven. Boos Butcher Block/Cutting Board. New calphalon pots & pans and charcoal grill with smoker! This was our second Kemp property that we've stayed in. We are confident that our third will be just as amazing... They provide all the amenities to entertain your family and friends. It truly felt like our home away from Frankenmuth! Thoroughly enjoyed our first trip to the UP visiting the region for Spring Break and a late season snowmobiling trip! Accommodations were outstanding as the home is laid out nicely, well furnished and very relaxing. Plenty of space for parking, good access and close to Chassell. This will definitely be the first place we try to book on future trips to the area. Thanks again Sandy! beautiful accommodations, plenty of beds for 6 - 8. Caretaker does a great job of plowing so there is plenty of room for trucks and trailers, we had three and there was room for more. Heated floor was a nice touch! very nice. clean. well stocked. cozy. comfortable. Great way to enjoy the Keweenaw. highly recommended. Chassell it the town just before Houghton and MTU University!! 70 miles to Lake in the Clouds, not far from Copper Harbor and the casino!! Fantastic quite country setting! OWNERS CANCELLATION POLICY: Refund all but $250.00 if you cancel 60 days or more prior to your reservations. 60 days or less I do not give a refund unless I can get someone else to take those dates. The rate is between $230- $300.00 per night depending on the number of nights booked and number of people in your party. Rates are subject to change until you have a confirmed reservation. The pet fee is $20.00 per night per pet. VRBO will not allow me to put a per night per pet fee to auto calculate.